After a while, after time spent channeling the flow…ideas are abundant and sketch books are full. Bloggity blog...oh how long it's been....my apologies for such contempt, or lack of intent. Quickly now, we shall let the past shrivel away... and make way for the newness...for the now! As we write this post, we know not how it will end, but we know it's going to be full of thoughtful things and improbably won't make sense all the time! ;) But, when we try to avoid starting sentences with BUT, it only reminds us to let go of those unnecessary rules and guidelines we swallowed so long ago. let's just communicate...be here, on the page together. Have I got your attention yet?! No matter, we shall continue this journey of discovery into the new, with or without you. Today is magical, and yet we often forget this simple fact. Today is where all opportunity blooms, and all action takes place. Right now, is the only moment that counts toward the building of our stories. These stories grow relentlessly, and without pause...our beliefs become the paths we take, and our fiction becomes the facts we live by over the trials of time. While we're talking about the story, and creating it at the same time, we have this opportunity to recognize that we are the author of our own story. This awareness is fleeting, as are all things, but it is also the doorway that leads to beautiful things. The saying "beauty is in the eye of the beholder" lets us know that where ever we look, we decide what to see, and if we should choose to see the beauty more often that not, we give ourselves a wonderful gift....a gift that no one else can give. And so, we've entered the competition, where the opponents are merely differing views of the same facts...what we can call fiction. This fiction is our reality, it is our story, and it is our boundaries. When we step outside of our boundaries, the story starts to change, and the fear starts to grow, but so do hope and motivation. Our motivation for courage to stay the new course, and find new purpose, new beauty, outside the shadows of our stories past. Spend enough time outside the old boundary, and a careful tip-tow turns into a steady stride...leaping towards beauty, away from the shadows pull. We're in a new place now, undiscovered, untold...where creation is the master and we are the space between what is, and what is soon to be. No map. No problem. We follow our fears, and trample our ghosts, as they pop up from time to time and to remind us how far we've come. Identify, Clarify, Focus, Practice & Move! Imagine the place we want to be, and become the change we want to see. We got this far, we are surely curious, and that alone will take us far. BUT! It will not deliver us into beauty, since beauty is not in travelling minds or travelling hands, but in decisive times. Along the advent of awesomeness, take the first step outside the boundary, and let the fear pull you toward triumph. Forget not the likes of human nature, for everything in site is beautiful, but not always for us. Stop from time to time to reflect, breath, absorb, feel the ground beneath your feet, and let the wind make sounds across your mind. In all that is present, is all that we know...for in this time, this place, and this space, we shall: fight with this heart, heal with these hands, and surrender this body. Undoubtedly. Where does it all come from, and why am I even doing this? Questions I ask myself on a regular basis. There's always the option to just throw it out, because it's ugly! Sometimes that's the best thing to do, however with furniture made from solid wood, there's often a better choice. I try to see potential in old pieces, weather it's the need for a simple sanding and re-finishing, or if "further action is required". 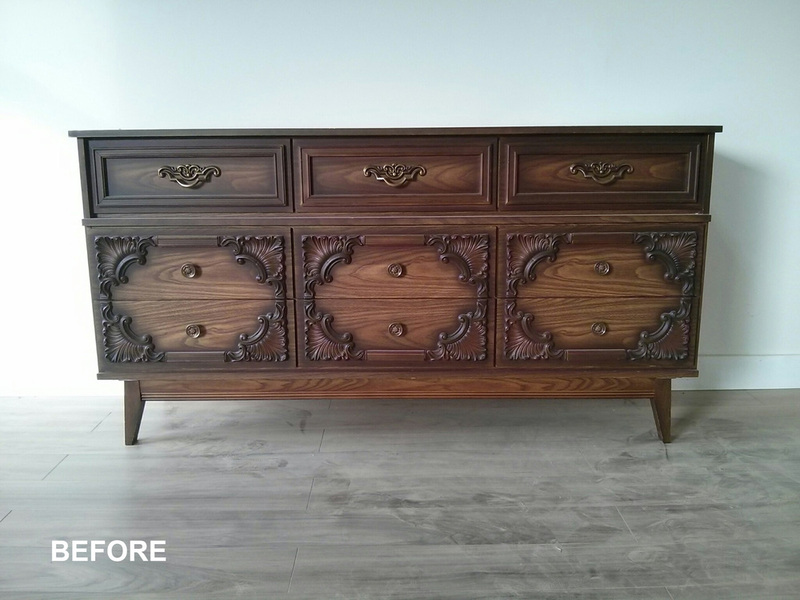 This dresser I found at a local thrift shop, said to me: "further action required", but the bones were there, and perfectly set for a modern face lift. Honestly, it's funky on its own right, but maybe not the kind of funk you want hanging around. I had some cut offs of various wood veneers hanging around the shop, those bits you usually never get to use. Turns out they were just the right size for re-facing drawers! Luck so had it for me, the "carved" sections you see, were nothing but plastic moldings tacked on with nails. This made them quite simple to remove, which could have easily gone the other way! Found it's new home already with the lovely Miss Nguyen, who served us up hand made Gyoza on delivery! Yuuumazing! Oh, and did I mention how fun it is to use a real branding iron!! My uncle's would laugh, having been raised as cowboys doing the real thing, but what can I say.... burnt bamboo is the freshest! "I hope you find this ~Aluminating~..."
As designers we constantly seek to innovate and to improve on the current model, which is an increasingly difficult task within the information super highway. It seems every new idea has already been done. So, I re-visited an old idea. A table design from my student years. The pull for me was the intent behind this original design: "be simple to manufacture, and reduce waste". This table design, originally named "Design Blanket" or "Canvas", attracted me by it's blank slate attributes. You take a piece of metal, bend it twice, and you have a table effectively....but you also have a surface that can look or be anything - print on it, laser cut it, veneer it, paint it, scratch it, use it! And whatever you do to it, it will always be there as table, no legs to come loose, no parts to fall off, no rust. All this coming from the underlying material. Aluminum. Boasting many desirable properties, not least of which is the fact it is nearly %100 recyclable. That's value, and that's meaningful, especially in a world filling up with waste, and built in obsolescence. It's hard to appreciate the design until you get up close to use the table, and feel the smooth curved edge of the table hugging the arch of your foot while you lounge on the couch. The reality is, the aluminum is almost entirely hidden, only it's strength is revealed. The real treasure is in the finishing materials. For this new set, a single sheet of wood veneer wraps the "canvas", and the grain of the wood becomes the painting. It also warms the table to the touch. Underneath the surface, as always, lays the inner beauty. So often in life the magic is hidden "beneath the surface", which is the name of the bent plywood coffee table that both preceded and inspired this new design. Without saying too much more, I hope you enjoyed hearing a bit of the story, and with any luck it inspires you to go out and create your mind's eye. To all the other artist's and artisans out there pushing back against the machine, here's to creating pieces that will last generations, through harnessing of the material, a focus on beauty, and as always - keeping it simple! Every now and then some inspiration comes along to motivate you to do those things you want to do, but never make a priority. Well, I found my shop mate revamping his side of the shop and shaping things up a little. So, I decide to finally clear out my clutter for a dedicated staging area. It's time to start capturing all the action. Without further ado, here's the first stage, featuring the recently completed, and fully restored, vintage walnut desk. The chair is not my design, but I'm lovin' it! SHOUT OUT: Love to my 'GranAnne' for sponsoring the flooring, and helping me build my dreams. Exciting day for me! 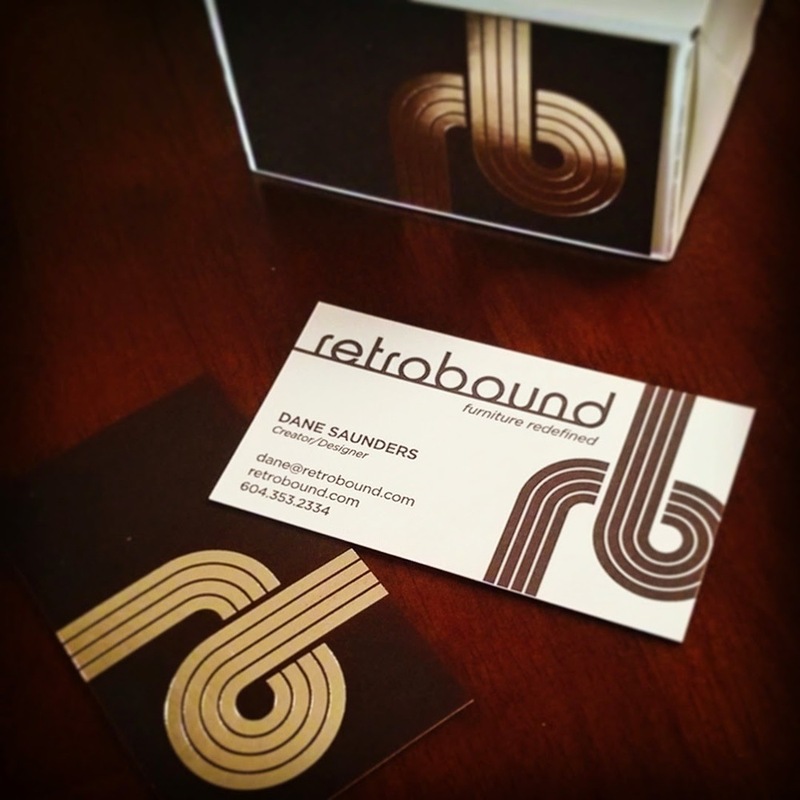 Got the call from Porchlight Press today saying my business cards were ready. The final product is outstanding, they did amazing job. Now, it's time to spread the product! Also, a shout to a dear family friend and fellow designer, Wendy Sherstan, for help bringing the logo to life! Send ahead for big things, and you will get big things.....like an enormous 1800sq.ft warehouse that I secured May 2014! Now it's time to turn it into a place where dreams, ideas, and objects become one. So far the family support is amazing...even tangible. Just produced my first product for my sister's blossoming photography business... a sandwich sign made of reclaimed fir, ceiling panels from an old home. Making the stencil was labor-some, might do that differently next time, but overall the experience was great. Best of all it left my sister with a big smile on here face.